Christopher Walters is currently deployed overseas. His wife, Jaime, had sent in a check and an apology for being late on a payment to her husband’s account. He had been renting storage space at Reiman’s for his motorcycle while he was deployed. When dealership owner Dennis Packee saw Jaime’s letter, he would have none of it. Dennis Packee says that this has been the policy of Reiman’s Harley-Davidson during the entire 18 years of his ownership. He figured other dealerships had similar policies, but wasn’t certain specifically. But this was just something he felt needed to be policy at Reiman’s. He was nearly drafted during the Vietnam War (a medical issue was discovered while he was being processed and was subsequently discharged), and he remembers the hardships many of the troops endured upon their return. He said he has a cousin that was severely injured while serving in Vietnam. Waiving storage fees was something that he could do to support the troops of this era, serving in Afghanistan or Iraq. It was his way of simply giving back to those that had given so much. Packee hadn’t really thought much about the gesture. It was policy and seemed like common sense to him. A no-nonsense fellow, he just felt he was doing the right thing and went back about his work and life. And then the phone began to ring. At first it was a man from New York. He had called Reiman’s to thank Packee for waiving the fees and his support of the troops. Dennis Packee thought that this must have been a family members of the Walters said he was glad to be able to help. Then a man from California called with the same message. Then a man from Ft. Bragg in North Carolina called. “I want to say thank you for what you did, it was very nice,” Packee relayed the man had said. So he asked, “How well do you know them, the Walters family?” The man said that he didn’t actually know the Walters. “Then how did you know about the letter?” asked Packee. “Didn’t you know? It’s all over Facebook,” said the man. Dennis Packee is not a Facebook user, and leaves social media contact to his son, Scott. He asked Scott about the letter. 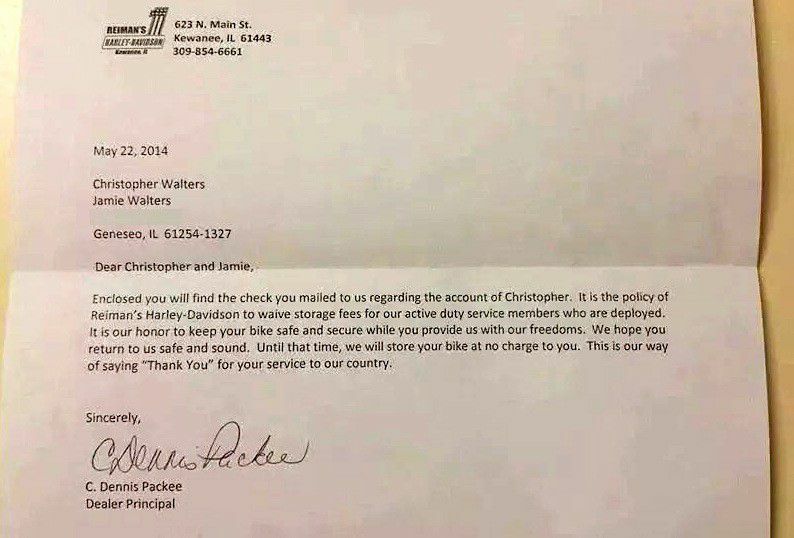 Scott said, “Dad, I didn’t want to tell you, but this is everywhere.” Jamie Walters had posted a photo of the letter as a thank you to Reiman’s Harley-Davidson for their support of the troops. But Dennis Packee is very adamant that this wasn’t done for the notoriety. The letter was to state the policy and it’s a policy he has held dear for years. They have space to store about 120 motorcycles, with Christopher Walter’s bike being the only current military bike in storage. Other servicemen and women have stored their motorcycles there during past deployments but have since picked them up. Support of the troops was such a second nature to the staff at Reiman’s that they even held a welcome home party for a serviceman who had purchased a bike online during his deployment. They held it until his welcome home parade and had it out in front of the shop so that he could see it from his bus, with a cake waiting inside. And then a new call came in. His niece at the dealership handed Packee the phone, and the caller identified himself as Rear Admiral Terry Kraft, currently aboard the USS Ronald Reagan. Packee is insistent that he didn’t do this for the notoriety or the fame. He had no idea this would happen and says it just kind of exploded. He was shy and humble about the response at first–it didn’t make sense to him–but now he understands it.